Call the police. Your first step when you realize your home has been burglarized should be to call the police and have them come document all your missing items and damage to your home. Document what was stolen. It is good practice for everyone, regardless of whether they’ve been burglarized, to have an active list of valuables in their home. Following a break-in, check this list to make sure you know exactly what was stolen so you can report it to the police and make their job a little easier. It may also be worth it to photograph where all your valuables are to see where they were stolen from. Check security cameras. Any footage or evidence you are able to give to the police will help them catch the thief and bring them to justice. If you do not own cameras but would like to learn more about them, visit here. Contact your insurance provider. It’s important to file a claim of what was stolen within 24 hours of the break-in. You can also provide the insurance company with a detailed list of what was damaged to help them figure out how to best help you, including sending someone to repair any broken windows or door locks immediately. The insurance company will need the finalized police report before they can fully cover everything stolen from your home. Start cleaning up your home. Once the police have all the evidence they need, begin to clean up any broken glass, trashed rooms, and other messes left by the thief. 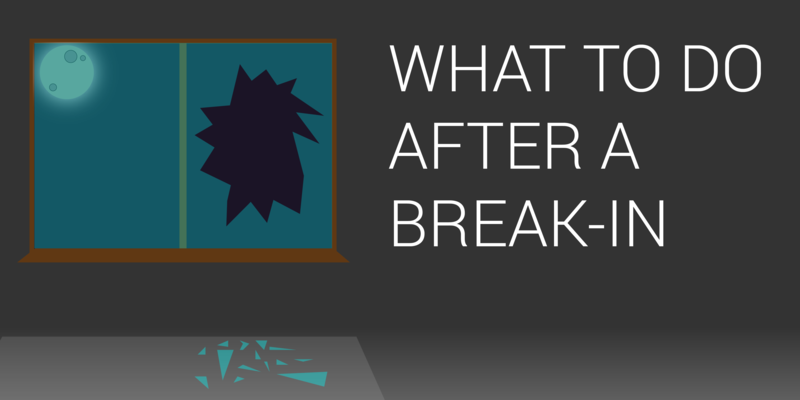 Cleaning up can be cathartic and also help you recover from the shock that your home was robbed. Figure out how you can better secure your home from future burglary attempts. How was the burglar able to get into your home? Did they break a window, kick in a door, or was an entryway left unlocked? Figuring out where your home’s weaknesses are can help prevent burglars from trying again. Finally, consider installing a home security system to provide the maximum deterrent for a return burglary. The good news is, with a proper security system and cameras, your home will be extremely secure and less of a target to burglars. If you don’t already have a system, call Doyle Security at 1-866-GODOYLE or fill out a consultation form on our website and we can provide an in-depth security consultation for your home, free of charge. For more information about burglary statistics, click here to visit Alarms.org and learn more about keeping your home safe.